Background: Structural changes such as erosions, syndesmophytes and ankylosis are characteristic of ankylosing spondylitis (AS). These can be quantified by the modified Stokes Anklylosing Spondylitis Spinal Score (mSASSS). It is unknown which radiographic feature is most relevant for the assessment of change and the prediction of future damage in AS. Objectives: To analyse radiographic progression in AS by using different assessments to define the most important changes. Methods: Spinal radiographs of 116 patients with AS were scored by the mSASSS at baseline (BL) and after 2 years. Radiographic progression was assessed by differentiating (1) any change; (2) progression to syndesmophytes/ankylosis (definite change); and (3) changes exceeding the smallest detectable change (SDC) as predefined. A growth angle of 45° was used to differentiate syndesmophytes from spondylophytes. Results: Some radiographic progression after 2 years was detected in 42% of patients, novel syndesmophytes in 31% of patients, and, using the SDC (calculated at 2 mSASSS units) as cut-off, progression was seen in 28% of patients. Thus, in 74% of the patients changes were because of syndesmophytes and/or ankylosis. Using the predefined cut-off, only 12% of all syndesmophytes were spondylophytes. Patients with such changes were of older age. Definite radiographic progression was found in 44% of the patients with syndesmophytes/ankylosis at BL (n = 57) versus 19% (p = 0.03) of the patients without such changes (n = 59). Conclusions: Syndesmophytes and ankylosis are the most relevant structural changes in AS, and also in the mSASSS. Development of just one syndesmophyte within 2 years indicates progression of structural changes in AS; this is relevant for clinical practice. Syndesmophytes are the best predictors of radiographic progression. Ankylosing spondylitis (AS) is a common chronic inflammatory rheumatic disease that affects the axial skeleton in young patients.1 AS starts in the sacroiliac joints and spreads to the spine in most patients.2 New bone formation, syndesmophytes and ankylosis of the vertebral column are almost pathognomonic for AS. One major question in imaging studies is whether there is radiographic progression in patients with AS; another question is whether the scoring system is capable of detecting it and which proportion of patients shows change. There is a lack of valid prognostic parameters of radiographic progression in patients with AS. In a preliminary study with a small cohort, the presence of radiographic damage at baseline was shown to predict future structural progression11,12—in this case as defined by a higher modified Stokes AS Spine Score (mSASSS13). The mSASSS has been identified as the best scoring method14 for the evaluation of chronic changes of the spine in patients with AS. One known disadvantage of the mSASSS, which is true for all radiographic scoring systems in AS currently available, is that the most commonly involved part of the spine in AS, the thoracic spine, cannot be assessed because of technical reasons.15 Thus, as this most commonly affected spinal region is not included in x ray studies, a high percentage of spinal lesions cannot be assessed in such evaluations. This may lead to the relatively low sensitivity to change, which is known from the mSASSS. Because the assessment of radiographic progression is crucial for new16 and old17 treatments of AS, the reliability of the scoring system is important and critical to make sure that there is “true” structural progression and not measurement error owing to the imaging technique or the scoring system. Consequently we took advantage of the availability of recent German AS cohorts including patients who were and were not treated with tumour necrosis factor (TNF) blockers to evaluate the radiographic progression in patients with AS by using the mSASSS from different perspectives. First, we considered which radiographic change would be most convincing for assessment of radiographic deterioration. Therefore, we studied the development to syndesmophytes and ankylosis as the clinically most impressive indicator for progression of the disease. Second, we considered how this radiographic sign might contribute to the assessment of radiographic progression in relation to predefined calculated values such as SDC and SDD. Finally, with regard to the high prevalence of spinal osteophytes in the population, we investigated whether syndesmophytes are possibly mixed up with spondylophytes (ambiguous syndesmophytes) when scoring the mSASSS, because this may lead to a systematic error and a low specificity of the scores. Thus, the main objective of this study was to further validate the performance of the mSASSS, including the definition of the SDC, and to define the best cut-off for change in spinal radiographs in patients with AS. In addition, we reassessed the question of whether structural damage at baseline predicts future radiographic progression. All 116 patients with AS had complete sets of spinal lateral radiographs of the cervical spine and the lumbar spine at baseline and after 2 years of follow-up. All x ray examinations were conducted by using the same standardised examination protocol. After blinding for treatment and time order of imaging, all images were scored by one reader (XB) using the mSASSS.13 For the calculation of the SDC,7x rays from 78 patients were randomly selected and scored by another reader (HH) who used the same approach. Agreement between readers was defined as no difference in the same mSASSS change scores between time points. Some disagreement was defined as a small difference of less than or equal to the calculated SDC and major disagreement was defined as disagreement greater than the SDC. After the first evaluation of the scores, all vertebral edges initially scored as 2 (occurrence of syndesmophyte according to the mSASSS) were evaluated for a second time to find out how many could have possibly been confused with spondylophytes. Such syndesmophytes were defined as “ambiguous” syndesmophytes. This differentiation was made by drawing a line between the anterior vertebral edges of the same vertebral body. This line was used as a reference for the direction of the vertebra. Thereafter, a second line was drawn at a 45° angle to the edge (fig 1). Bony changes with an angle ⩽45° to the anterior vertebral side were defined as syndesmophytes, in contrast with changes with an angle of >45°, which were defined as ambiguous syndesmophytes (fig 1). Differentiation between syndesmophytes and spondylophytes by using the 45° angle as a cut-off. Syndesmophytes grow in an angle of ⩽45° to the vertebral edge (here 12.3°), while spondylophytes grow in an angle of >45° to the vertebral edge. For calculation of the SDC, the scorings of both readers were used. The SDC was calculated as described,7 on the basis of the measurement error, a prespecified statistical 95% CI and a prespecified coverage probability of measurement errors (80%). This calculation chosen to achieve a high sensitivity implies that up to 10% of patients with or without a change in the mSASSS could be either falsely classified as positive (but having no “real change”) or as negative (but having real radiographic progression). The paired Wilcoxon rank-sum test was used to compare the readings between different time points, and the Mann–Whitney U test was used to compare the data between subgroups at single time points. Wilson’s method was used to calculate 95% CIs of proportions. The mean mSASSS of all 116 patients worsened from 9.3 (14.0) at baseline to 10.7 (15.2) after 2 years (p<0.001). Any radiographic progression was seen in 49/116 patients (42.2%, fig 2). Patients with definite radiographic damage at baseline had more radiographic progression than patients without radiographic damage at baseline: mean mSASSS change 2.6 (4.0) vs 0.8 (1.4; p = 0.002 between groups). Cumulative probability plot for the individual radiographic progression in all 116 patients included in this study. Progression scores can be read from the y axis. 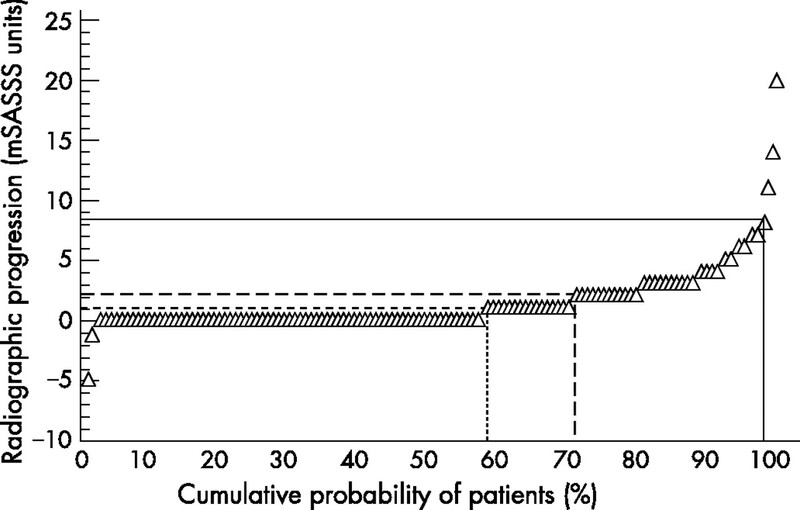 Accordingly, the cumulative probability of the percentage of patients with radiographic progression over each different assessment aspect can be found by drawing a straight line from the corresponding percentile to the x axis. 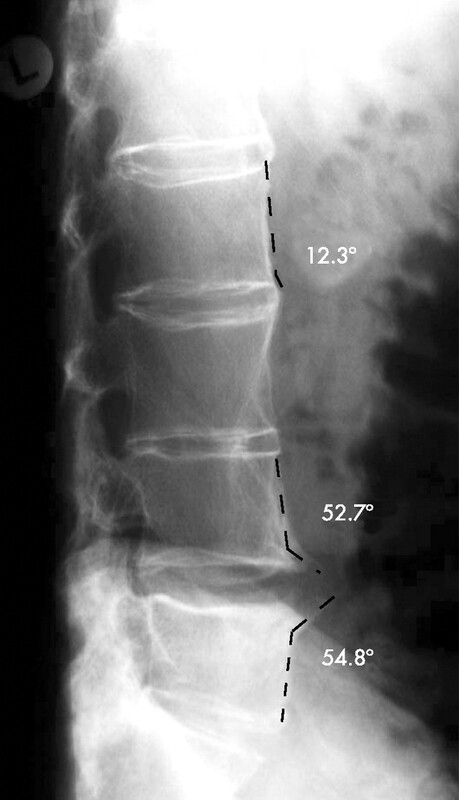 Continuous line: smallest detectable difference; uncontinuous line: smallest detectable change; and dotted line: change of ⩾1 modified Stokes Anklylosing Spondylitis Spinal Score (mSASSS) unit. Overall, 28/116 (24.1%) patients had no baseline radiographic damage. Of those, 5 (17.9%) patients developed new structural lesions at follow-up, including 3 who developed at least one syndesmophyte. All 5 patients progressed ⩾SDC after 2 years. No radiographic damage (mSASSS = 0) or suspicious changes such as erosions, sclerosis or squaring (mSASSS = 1) without signs of definite damage at baseline was found in 59/116 (50.9%; 95% CI 41.9% to 59.8%) patients. Definite radiographic progression (deterioration to syndesmophytes or ankylosis (mSASSS = 2 or 3)) after 2 years was found in 11 of those 59 (18.6%; 95% CI 10.7% to 30.4%) patients. In more detail, 8/31 (25.8%; 95% CI 13.7 to 43.2) patients with only minor radiographic damage (mSASSS score = 1), and 3/28 (10.7%; 95% CI 3.7 to 27.2%) patients without any damage at baseline (mSASSS score = 0) had definite deterioration. There were no clinical and/or demographic differences between the 59 patients described above, and the remaining 57/116 (49.1%) patients who had definite radiographic damage at baseline. Of the latter, 25 (43.9%; 95% CI 31.8% to 56.7%) patients had a definite deterioration. Thus, in the entire group, independent of the baseline radiographic status, definite radiographic deterioration was found in 36/116 (31%; 95% CI 23.3% to 39.9%) patients. Similar results were found when single vertebral edges were evaluated for definite progression (fig 2). Any radiographic progression was seen in 49/116 (42.2%) patients and in 177/2758 (6.5%) vertebral edges. On this basis, it can be calculated that the development of syndesmophytes or ankylosis accounted for the changes occurring in 36/49 (74%) patients and in 108/177 (61%) vertebral edges. Both readers were in agreement of the change in the mSASSS score between baseline and the 2-year follow-up in 42 (53.8%; 95% CI 42.9% to 64.5%) cases. The agreement was significantly higher (68.3%) for the scores of those 41 patients who had an mSASSS score of 0 at baseline (as scored by at least one reader). There was some disagreement in 25 (32.1%) patients, and major disagreement in 3 (3.8%; 95% CI 1.3% 10.7%) patients. There were no differences in clinical or laboratory parameters and also in radiographic damage (mean mSASSS) at baseline between the patients used for the calculation of the SDC and the remainder. The SDC was calculated at 2 mSASSS units. When using this as a cut-off, radiographic progression was seen in 32/116 (27.6%) patients at the 2-year follow-up. In the subgroup of patients without definite baseline damage (only mSASS-scores of 0 or 1), only 7/59 (11.9%) patients showed progression ⩾SDC after 2 years. By contrast, in the subgroup with definite radiographic damage at baseline, radiographic deterioration ⩾SDC was found in 25/57 (43.9%) patients (p<0.05 between groups). Figure 2 shows a comparison of the radiographic progression seen in individual patients when using the three different cut-off levels (mSASSS, SDD and SDC). The cumulative percentage of patients developing radiographic progression between baseline and after 2 years is reflected on the x axis (table 2). Overall, 150/2748 (5.5%) vertebral edges were scored as 2 with the mSASSS, indicating the presence of a syndesmophyte. When the 45° angle was used to differentiate syndesmophytes from spondylophytes (ambiguous syndesmophytes, see the Methods section), only 18/150 (12%) vertebral edges showed a growth angle >45°. The remaining 132/150 (88%) vertebral edges were identified as typical syndesmophytes. On an individual patient level, ambiguous syndesmophytes with an mSASSS score of 2 in at least one vertebral edge in either the cervical spine or the lumbar spine were found in 13/58 (22.4%) patients. After 2 years, only 2/18 ambiguous syndesmophytes in 2 patients had been scored as having progressed to ankylosis, while the remaining 16 had not changed over 2 years (11/58 patients). There was no difference in the clinical characteristics of the whole group of patients with definite syndesmophytes and ambiguous syndesmophytes (data not shown). Inclusion or exclusion of ambiguous syndesmophytes in the analysis did not change the overall result of the scoring exercise (data not shown). The patients were further divided into subgroups on the basis of mean age, mean disease duration and presence of syndesmophytes/ambiguous syndesmophytes (table 3). Patients with syndesmophytes (mean age 41.3 years) were older than those without syndesmophytes (mean age 35.6 years; p = 0.001). The mean number of syndesmophytes in patients aged younger than or equal to or older than the mean age of 38 years was significantly different: 1.9 vs 3.3, respectively (p = 0.002). The mean number of syndesmophytes in patients with a disease duration less than or equal to vs greater than the mean disease duration of 11 years was not significantly different: 2.2 (4.5) vs 3.0 (4.7), respectively (p = 0.14). Patients with ambiguous syndesmophyttes were older, and had higher mSASSS and BASMI scores than those without such changes (table 3). This study emphasises the central role of syndesmophytes as indicators of radiographic damage and progression in patients with AS. On this basis and on the background of the OMERACT filter,25 our study adds face validity to the mSASSS, which is also confirmed to be sensitive to change in the detection and quantification of radiographic progression in AS over 2 years. The mean mSASSS change of all patients with AS was 1.5 (2.9) mSASSS units over 2 years. These data on spinal radiographs of 116 patients with AS are relevant for both clinical studies and clinical practice. The central role of syndesmophytes and ankylosis was clearly established as half of the patients had such changes at baseline, and the progression rate was 31% using that target versus 42% for any change. This shows that almost 75% of the patients with change as defined by the mSASSS developed syndesmophytes and ankylosis. On the basis of a recent publication,7 we calculated the SDC at a change of ⩾2 mSASSS units. This does not necessarily indicate the presence of a syndesmophyte, as two scores of 1 mSASSS unit would also sum up to a score of 2. However, this is a relevant cut-off that leads to a rate of detection of radiographic change in 32/116 (28%) patients with AS after 2 years. Nevertheless, concentrating on syndesmophytes/ankylosis seems to be superior. Confirming the results of an earlier study,6 we found that only 2/116 (2%) patients using the SDD showed radiographic progression after 2 years. As this reflects an underestimation of structural changes as documented in this study, the SDD seems not to be useful when scoring with the mSASSS. As syndesmophytes are critical for radiographic progression, we were interested in studying the relative proportion of syndesmophytes and spondylophytes appearing as ambiguous syndesmophytes, as these are difficult to differentiate. Because there is no agreement in the literature until now on how to handle such osteophytes, we used, for the first time, a practical approach by setting a 45° angle as a cut-off. This proposal refers to the best-known difference between such spinal osteophytes: the horizontal versus the vertical orientation of this rather localised bone growth. We are not aware of any other studies on this topic. Although this approach has not been formally validated so far, we think that it has sufficient face validity. On this basis, we show that ambiguous syndesmophytes are not a rare finding in patients with AS with an incidence of 12% of all vertebral edges occurring in about 20% of the patients studied. However, these ambiguous syndesmophytes did not show much change over time. Their inclusion in the analysis has not influenced the final study result. However, the evaluation of chronic spinal changes in patients with AS needs more study and an international consensus to determine whether and how such ambiguous syndesmophytes are best assessed and whether they should be included or excluded in clinical studies. In the subgroups analyses, we found that patients with ambiguous syndesmophytes (n = 13) were older than patients without such changes. One possible explanation is that degenerative changes are known to occur more frequently in older patients. The lack of a statistically significant difference in age between patients with shorter and longer disease durations may point in the same direction. However, the number of patients with ambiguous syndesmophytes was rather small and the mean age of the patients was relatively young in this study. Improvement of the mSASSS was found in 40/2737 (1.4%) vertebral edges. Of those 40, 36 showed a change from 1 to 0 and only 4 vertebral edges showed changes from 2 to 1. Looking at these images for a second time, we think that this is not reflecting real improvement or healing as reported in RA26–28 and PsA,29 but rather a phenomenon that is due to a reduced quality of some radiographs. These scores had no effect on the results of the analyses. Another important aspect of our study is the confirmation that radiographic damage at baseline is a major, and the only currently known, predictive factor for future structural progression.11,30 Thus, patients with radiographic damage at the time of presentation are significantly more prone to show radiographic changes after ⩾2 years, independent of age or disease duration. However, we could even extend these earlier reports by showing in our study that 44% of the patients with definite damage at baseline developed syndesmophytes after 2 years, whereas only 19% of the patients without definite baseline damage showed definite radiographic deterioration. This indicates that the presence of a syndesmophyte or ankylosis is a stronger predictor of further structural changes than minor changes such as erosions or sclerosis. In summary, according to the present data, the calculation of the proportion of patients with AS with definite radiographic progression (syndesmophytes, ankylosis) may be regarded as a new gold standard for the assessment of radiographic change in AS. Furthermore, definite radiographic damage (syndesmophytes, ankylosis) at baseline is even more predictive of radiographic progression. The large proportion of patients showing radiographic deterioration from minor to more definite changes such as syndesmophytes has been useful in confirming the truth and discrimination of the mSASSS. Braun J, Bollow M, Remlinger G, Eggens U, Rudwaleit M, Distler A, et al. Prevalence of spondylarthropathies in HLA-B27 positive and negative blood donors. Arthritis Rheum1998;41:58–67. Braun J, Sieper J. The sacroiliac joint in the spondyloarthropathies. Curr Opin Rheumatol1996;8:275–87. Braun J, van der Heijde D. Imaging and scoring in ankylosing spondylitis. Best Pract Res Clin Rheumatol2002;16:573–604. Heuft-Dorenbosch L, Landewé R, Weijers R, Wanders A, Houben H, van der Linden S, et al. Combining information obtained from magnetic resonance imaging and conventional radiographs to detect sacroiliitis in patients with recent onset inflammatory back pain. Ann Rheum Dis2006;65:804–8. Braun J B M, Sieper J. Radiology and pathology of the spondyloarthropathies. Rheum Dis Clin North Am1998;24:697–735. Spoorenberg A, de Vlam K, van der Linden S, Dougados M, Mielants H, van de Tempel H, et al. Radiological scoring methods in ankylosing spondylitis. Reliability and change over 1 and 2 years. J Rheumatol2004;31:125–32. Bruynesteyn K, Boers M, Kostense P, van der Linden S, van der Heijde D. Deciding on progression of joint damage in paired films of individual patients: smallest detectable difference or change. Ann Rheum Dis2005;64:179–82. Ravaud P, Giraudeau B, Auleley G R, Edouard-Noel R, Dougados M, Chastang C. Assessing smallest detectable change over time in continuous structural outcome measures: application to radiological change in knee osteoarthritis. J Clin Epidemiol1999;52:1225–30. Baraliakos X, Listing J, Rudwaleit M, Brandt J, Sieper J, Braun J. Radiographic progression in patients with ankylosing spondylitis after 2 years of treatment with the tumour necrosis factor alpha antibody infliximab. Ann Rheum Dis2005;64:1462–6. van der Heijde D, Wanders A, Mielants H, Dougados M, Landewé R. Prediction of progression of radiographic damage over 4 years in patients with ankylosing spondylitis [abstract]. Ann Rheum Dis2004;63 (Suppl 1) :98. Creemers M C, Franssen M J, van’t Hof M A, Gribnau F W, van de Putte L B, van Riel P L. Assessment of outcome in ankylosing spondylitis: an extended radiographic scoring system. Ann Rheum Dis2005;64:127–9. Wanders A J, Landewe R B, Spoorenberg A, Dougados M, van der Linden S, Mielants H, et al. What is the most appropriate radiologic scoring method for ankylosing spondylitis? A comparison of the available methods based on the Outcome Measures in Rheumatology Clinical Trials filter. Arthritis Rheum2004;50:2622–32. Braun J, Baraliakos X, Golder W, Hermann K G, Listing J, Brandt J, et al. Analysing chronic spinal changes in ankylosing spondylitis: a systematic comparison of conventional x rays with magnetic resonance imaging using established and new scoring systems. Ann Rheum Dis2004;63:1046–55. Braun J, Baraliakos X, Brandt J, Sieper J. Therapy of ankylosing spondylitis. Part II: biological therapies in the spondyloarthritides. Scand J Rheumatol2005;34:178–90. Braun J, Baraliakos X, Godolias G, Bohm H. Therapy of ankylosing spondylitis—a review. Part I: conventional medical treatment and surgical therapy. Scand J Rheumatol2005;34:97–108. van der Linden S, Valkenburg H A, Cats A. Evaluation of diagnostic criteria for ankylosing spondylitis. A proposal for modification of the New York criteria. Arthritis Rheum1984;27:361–8. Braun J, Brandt J, Listing J, Zink A, Alten R, Burmester G, et al. Two year maintenance of efficacy and safety of infliximab in the treatment of ankylosing spondylitis. Ann Rheum Dis2005;64:229–34. Baraliakos X, Brandt J, Listing J, Haibel H, Sorensen H, Rudwaleit M, et al. Outcome of patients with active ankylosing spondylitis after two years of therapy with etanercept: clinical and magnetic resonance imaging data. Arthritis Rheum2005;53:856–63. Braun J, Sieper J. Inception cohorts for spondyloarthropathies. Z Rheumatol2000;59:117–21. Rudwaleit M, Baraliakos X, Listing J, Sieper J, Braun J. The course of radiographic spinal lesions in patients with early ankylosing spondylitis over a 2-year follow up period [abstract]. Annual Meeting of the European League Against Rheumatism (EULAR), Vienna, Austria 2005. Landewé R, van der Heijde D. Radiographic progression depicted by probability plots: presenting data with optimal use of individual values. Arthritis Rheum2004;50:699–706. Boers M, Brooks P, Strand C V, Tugwell P. The OMERACT filter for outcome measures in rheumatology. J Rheumatol1998;25:198–9. Rau R, Wassenberg S, Herborn G, Perschel W T, Freitag G. Identification of radiologic healing phenomena in patients with rheumatoid arthritis. J Rheumatol2001;28:2608–15. Maini R N, Breedveld F C, Kalden J R, Smolen J S, Furst D, Weisman M H, et al. Sustained improvement over two years in physical function, structural damage, and signs and symptoms among patients with rheumatoid arthritis treated with infliximab and methotrexate. Arthritis Rheum2004;50:1051–65. Finckh A, Simard J F, Duryea J, Liang M H, Huang J, Daneel S, et al. The effectiveness of anti-tumor necrosis factor therapy in preventing progressive radiographic joint damage in rheumatoid arthritis: a population-based study. Arthritis Rheum2006;54:54–9. Kavanaugh A, Antoni C E, Gladman D D, Wassenberg S, Zhou B, Beutler A, et al. The Infliximab Multinational Psoriatic Arthritis Controlled Trial (IMPACT): results of radiographic analyses after 1 year. Ann Rheum Dis2006;65:1038–43. Baraliakos X, Listing J, Brandt J, Rudwaleit M, Sieper J, Braun J. Radiographic progression in patients with ankylosing spondylitis after 2 years of continuous anti-TNFa therapy [abstract]. Ann Rheum Dis2005;64 (Suppl III) :1462–6.